Joan Miró is the Spanish artist with whom I have always felt a connection. During my numerous trips to Barcelona, I have visited the Miró Foundation many times, and had the opportunity to contemplate his magnificent work. This work transports me to my most primitive, original essence, and to my paternal ancestors roots, as well. For this reason, when The Barnes Foundation called upon the artists to participate in this inspirational project, this work titled: Two Women Surrounded by Birds, immediately came to mind. In some ways, this particular piece matches with my own abstract style. 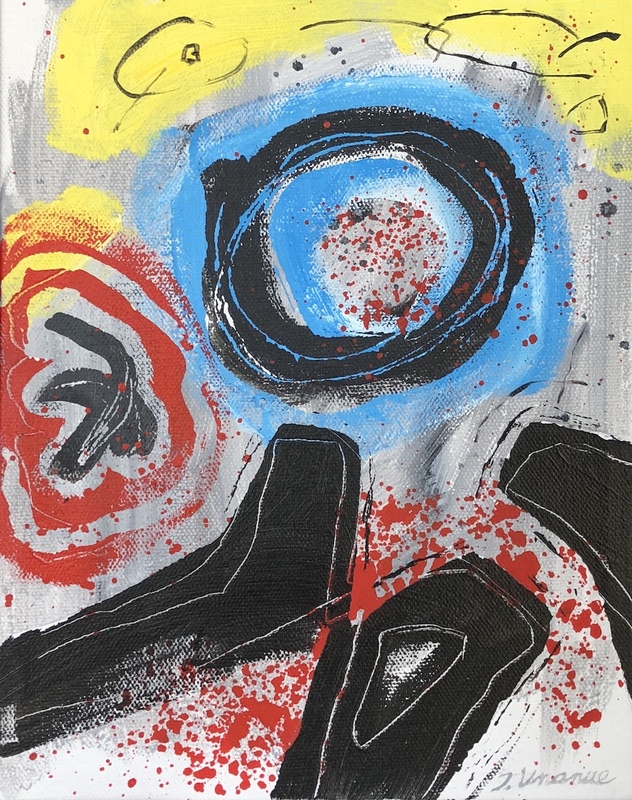 Inspired by its language of abstract forms- even when the human figure is depicted as birds- and the primary colors so characteristic of his work, I began to create my art for this exhibition. The most powerful moment of my creation was to paint the strong black color forms the end up creating a body not only of the physical, but also of the soul.